Note: Each course number links to a PDF of the master syllabus. The links will open in their own window. The list on the right reflects the latest changes to the curriculum. Trinity’s 5th term is a guided transitional period with two main goals: providing a facilitated review that guides students to a successful USMLE Step-1 exam (regarded by the NRMP as the most significant part of securing a residency), and preparing students for clinical clerkship training. Two structured courses CLMD 405 and CLMD 406 guide the student through this term. As part of this preparation, students complete important certifications required to begin clerkships: BLS, ACLS, PALS, Blood Borne Pathogens, and HIPAA trainings. The term takes place on St. Vincent and provides the focus and support of Trinity's campus and community, as well as access to resources and faculty, are optimal for USMLE Step-1 preparation. This is only multiplied by our students' continued access to Milton Cato Memorial Hospital, Trinity's affiliated teaching hospital. Students are eligible to enter clinical clerkships after passing the required NBME and USMLE exams. Students are required to take 48 weeks of clinical core clerkships and 27 weeks of electives. The core clerkships in medicine, surgery, pediatrics, family medicine, obstetrics/gynecology and psychiatry are the basic areas of medical practice about which all physicians need to be knowledgeable. They are included in the curriculum of every medical school. Participation in these clerkships also provides students with an understanding of the various core specialties in medicine. In the 12 week surgery clerkship, students are introduced to the principles of caring for the surgical patient. Students participate in the care of patients in the various stages of evaluation and treatment by surgeons. The student will begin to understand the general process of the application of surgical therapy to patients in a wide variety of settings as a member of the multidisciplinary team. 12 credits. The additional 27 weeks are spent in electives. The Senior Associate Dean of Clinical Clerkships will assist students in developing an Elective Plan which improves the student’s chances for a residency in a specialty of their choice. Following completion of core clerkships, a student may select to enter Prearranged Elective Tracks available in psychiatry, internal medicine, pediatrics, and family medicine in Chicago, IL. A Primary Care Track with a focus in family medicine, internal medicine, or pediatrics is available in Eastman, GA.
Click here for a PDF of the Trinity Medical Sciences University catalog. The Doctor of Medicine (MD) degree is awarded upon successful completion of the Foundations of Medicine curriculum, the Clinical Clerkships and the required NBME and USMLE exams. The foundations of medicine program is conducted at the Trinity School of Medicine campus in Kingstown, St. Vincent & the Grenadines. The 75 weeks of Clinical Clerkships are offered at approved sites in the United States or, with special approval at Milton Cato Memorial Hospital or other sites. Graduating students wishing to practice in the U.S. or Canada will register for the National Residency Match Program (NRMP) or the Canadian Resident Matching Service (CaRMS) which are paired choice systems for matching applicants to available residencies. Students train in a residency program for two to five years during which time they sit for the USMLE Step 3. 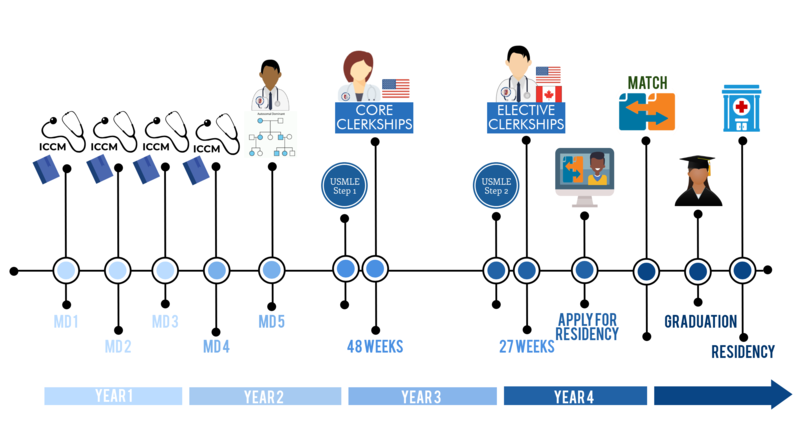 Upon completion of their residency (fellowship) and passing USMLE Step 3, candidate physicians are prepared for licensure in the U.S. or Canada. Students not wishing to practice in the U.S. or Canada must meet the licensure requirements of the country or countries where they wish to practice.